There is a good reason that Sydney is called Sin City. The Mardi Gras (on this weekend, for those of you not in the know) still takes place every year despite Fred Nile's fervent prayers. High-flautin' professionals swan about the city every weekday, and most evenings revellers spill out of clubs and hotels with little regard for other people. And, gazing over Darling Harbour, we have The Star. The Star is Sydney's only (legal) casino. What that means is that whilst you can barely turn left or right in Sydney without seeing a venue bulging at the seams with pokies, The Star is the only place you can play table games. Today this report appeared in the Herald. 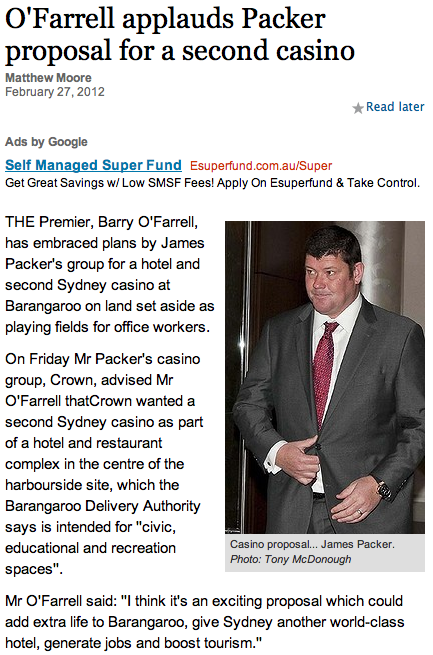 I don't know whether journos and editors are intentionally picking unflattering photos of James Packer, or if he just does not photograph well, but I have not seen him look good in a photo for a long time. As you can see, the trend continues here. 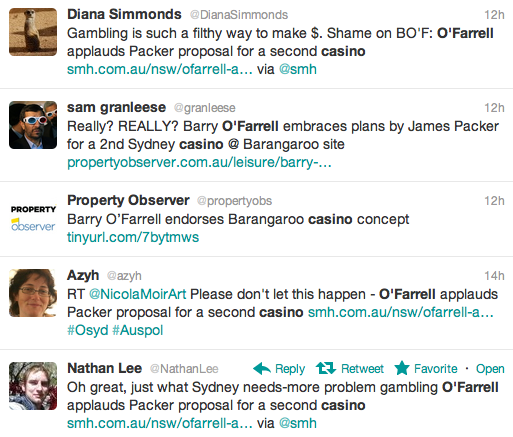 Anyway, it was O'Farrell's reaction that interested me, and enraged a number of people on Twitter today. Those of you who read this blog regularly and follow me on Twitter will be familiar with my views on pokies. Suffice to say I would very happily see them outlawed tomorrow, and if two out of every clubs went bankrupt I'd still call it a win. But table games (I mean true table games - not those electronic table games that clubs and hotels have) are somewhat different, at least in terms of perception. For one, they are legal only in The Star - given I seldom if ever go there, I seldom see them. Further rightly or wrongly, there is a perception that table games are far more likely to attract the high-flyer - the player who can afford to lose the money. Having said that, I'd encourage you to read this excellent post by Greg Jericho which portrays table games in quite a different light. 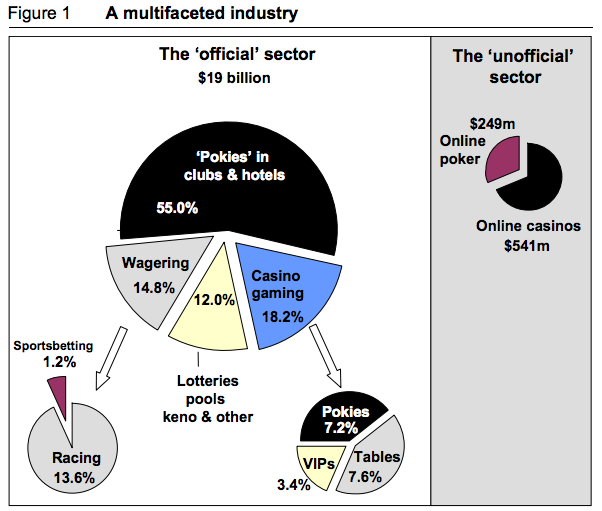 Let's have a look at some actual stats though, taken from the Productivity Commission's most recent report into Gambling in Australia. 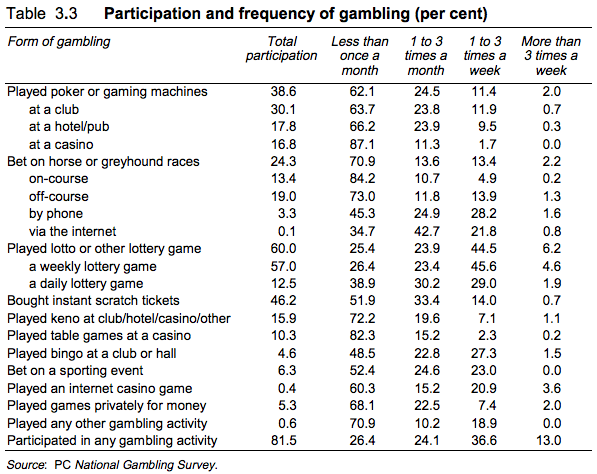 That stat was drawn from the Productivity Commissions 1999 report into Gambling in Australia. So, if approximately 10% of people have played a table game, and approximately 3.5% of them have experienced problems, we're talking 0.35% of the population. That sits in comparison with pokie numbers: 38.6% had played and 9.2% had experienced problems, or 3.5% of the population. That's a very quick and probably quite unreliable calculation - but it gives you an idea of the comparison. What it amounts to, for the purpose of this piece, is that table games are a far smaller problem than pokies. Having said all that, I still think O'Farrell's position is cause for significant concern. Why? First of all, I think it is inevitable that a new casino will result in more money being lost, and more problem gamblers pouring their saving away. The gambling industry is not a zero-sum game. The exact numbers will of course be a matter of much conjecture if this proposal goes anywhere, but they must move in that one direction. Weighed up against that harm, what are the benefits? Let's look at what O'Farrell nominates. - "Extra life". This is a nothing statement - any new business, attraction or facility will add "extra life". There is no need for it to be a casino. - "World class hotel, generate jobs". It is not clear why the casino would be a an essential part of any new hotel. There must be dozens of hotels in Sydney that do just FINE without any gambling profit. As for jobs, I have am not really interested in providing more jobs funding by taking money off problem gamblers. Heck, I'm barely interested in protecting those that already exist and depend on problem gamblers. - "Boost tourism". This is an odd statement. I'm happy to be proved wrong, but I find it hard to perceive how a second casino can boost tourism. I certainly understand that a first casino can have that effect. No doubt there are travellers in this world who will choose to travel to Sydney over another destination because it has a casino. Of course, putting a value on that tourism and inflow of money and weighing it against the damage caused by the presence of a casino is almost impossible, but I appreciate that the benefit exists. A second casino, however, is more difficult to justify. Are there really people who will say "What? They have TWO casinos? This I have to see." Like I said, if someone can point me to research that suggests otherwise, happy to be proved wrong. But it seems ridiculous. Above all that though, it is the eagerness with which O'Farrell has responded to the idea that concerns me. Why is he so keen to make this second casino happen? Does he have any intention of weighing up the potential for damage? Is the relationship with Packer cause for concern?